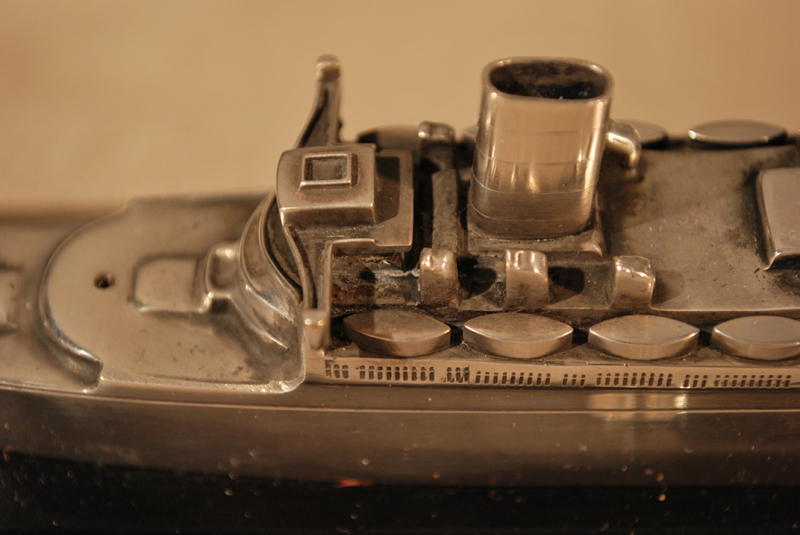 1935 Queen Mary silver plated "striker Lighter"
The RMS Queen Mary (Royal Majesty’s Ship) was built by John Brown & Company in Clydebank, Scotland in 1936. It was owned and operated by the Cunard Line (Cunard – White Star Line when she went into service). The Queen Mary was the flagship of the Cunard Line from 1936 to 1946 when she was replaced by the RMS Queen Elizabeth. She was converted into a troop carrier for the duration of WWII. After the war, the ship was retrofitted to carry civilian passengers. The Queen Mary and Elizabeth became the backbone of the trans-Atlantic passenger service. They were the premier carriers for the Atlantic between the cities of Southampton, Cherbourg and New York until the late 1950’s when jet service became the predominant means of travel. The Queen Mary was officially retired in 1967 and is now permanently docked in Long Beach, California where she houses restaurants, a hotel and a museum. 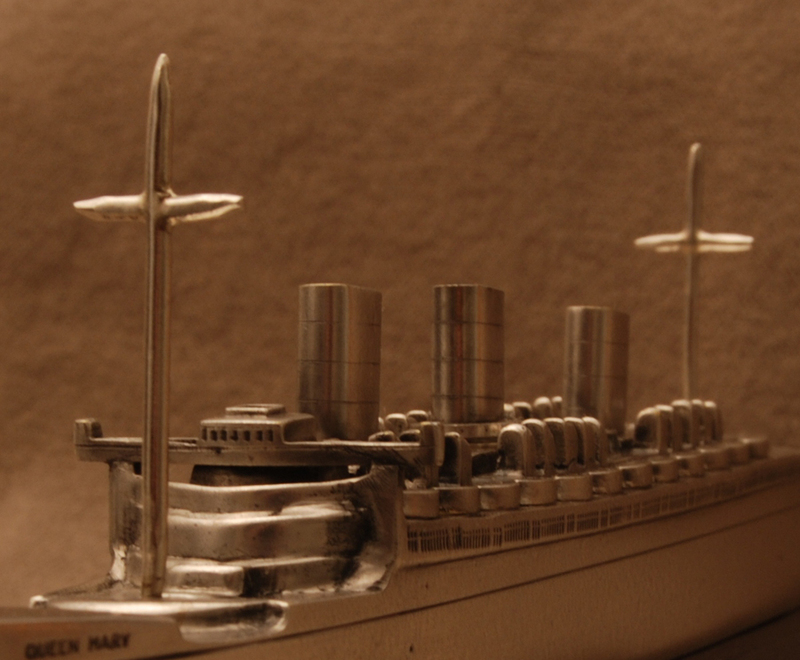 The silver plated ship model of the Queen Mary is a working “striker lighter.” This item was presumably sold in the first-class gift shop onboard the ship. Documentation notes that the lighter was made in 1936 or 37 just prior to the commencement of WWII when the ship was removed from passenger service for the war. Research on striker lighters generally indicates that they were produced and in vogue earlier than these dates. It is not clear why newer technology would not have been incorporated into this artifact. It has a registration number on base, but there is no information about who made this superb model and lighter. It could have been manufactured by a prominent lighter company like the Ronson Lighter Company of New York. 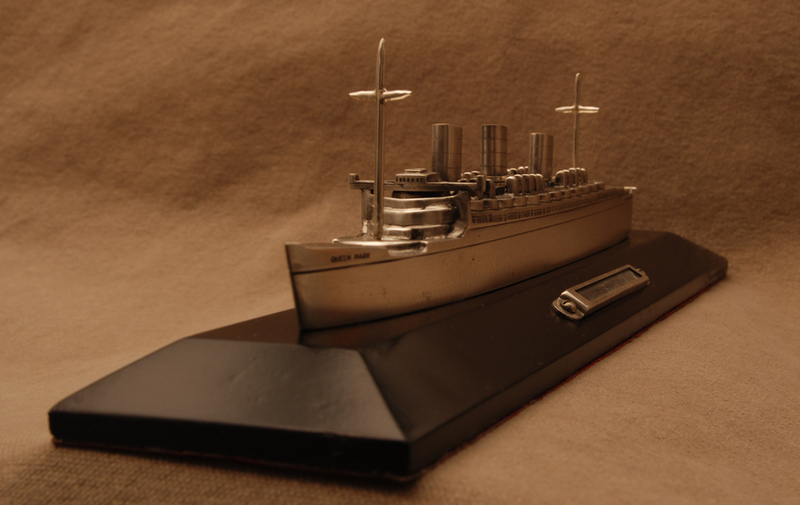 The Queen Mary “striker lighter” (2 ¾”h x 2 ¾”w x 11 ¾”l) was cast out of brass and has heavy silver plate coating. 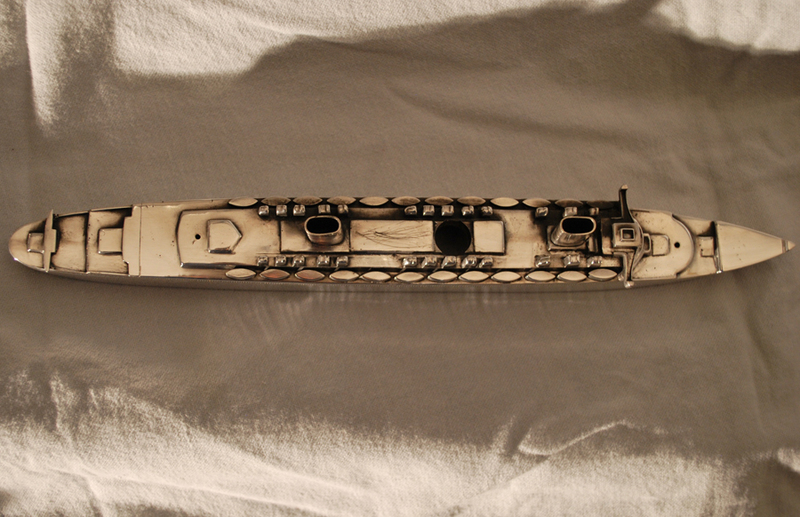 It has a separate brass lighter fluid tank, detachable striker (central smoke stack, but missing its wick), two flint strike plates with silver plated mounts and a wooden chamfered base that is painted black. There should be two delicate silver masts with crossing yards, fore and aft that screw into the deck, but they are missing. The words “Queen Mary” are incised into each side of the bow and “Queen Mary, Liverpool” on the stern. The silver plating had been deeply scratched from misuse of the striker on the top of the upper deck behind the central smoke stack (removable strike for lighter). There were also scratches on the sides of the cast life boats on both sides. Several areas of blacked tarnish were quite visible around the smoke stacks on the upper deck. The silver had been polished to the point that some of the detail had been lost or edges rounded. 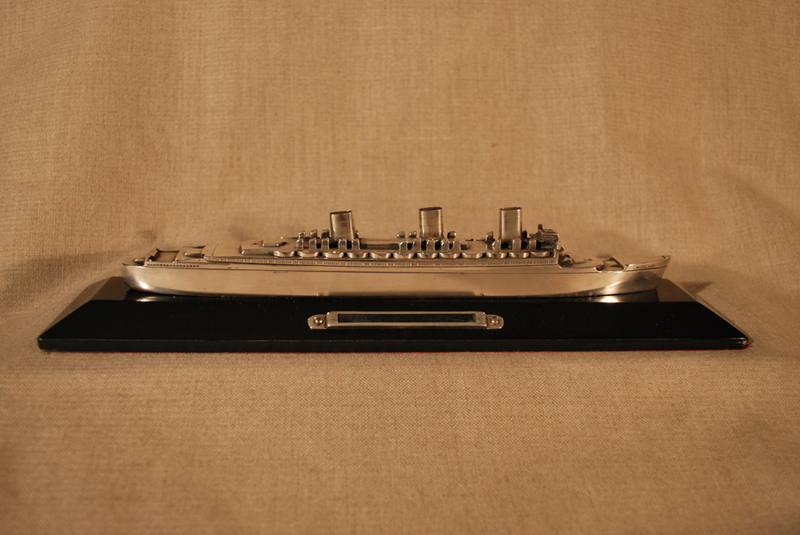 The ship model or strike plate covers were not lacquered. There was a numbered decal strip along the bottom side edge of the black base with two long registration numbers. One of these numbers was also on the side of the removable strike smoke stack. The base of the piece was covered with a red textured paper that looks like leather. It covers the remnants of the original covering that was an acidic black construction-like paper. The treatment was documented with written reports and digital photography before, during and after treatment. The red textured paper was carefully removed from the bottom of the artifact. It was found to be attached with double-sided clear tape. Remnants of the original black construction paper base were found. The red paper was retained and replaced on the bottom of the piece when the treatment had been completed. Two brass screw were removed that held the ship model onto the base. Once the ship was removed the lighter fluid tank was removed too. It fit tightly up through the ship with its top forming the base of the central smoke stack, into which the lighter strike was placed. The two silver plated flint holders, attached with screws, were also removed. 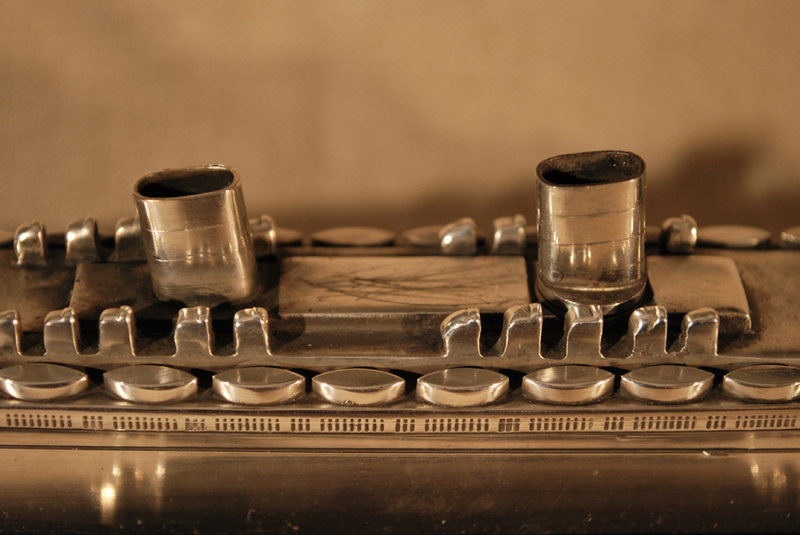 The entire surface of the silver plate on the ship, the exterior of the lighter fluid tank and the two silver strike plate holders were polished with a fine abrasive cream. This polish removed tarnish and fine scratches in the silver plate. The deep scratches next to the striker smoke stack were too deep to safely remove. The brass under the silver plating was visible in this area. After conferring with the owner it was decided to attach a thin piece of sterling silver, about the thickness of a piece of paper, over this area and attach it with conservation grade two part epoxy resin. After the epoxy had cured, the edges of the sterling piece were lightly filed to give it the same appearance as the other two top decks. This addition solved the problem, can be easily removed in the future if required, and created an identical surface appearance to surrounding areas. All metal components were degreased with organic solvents and then coated with a spray applied lacquer, which will prevent tarnishing of the metals in the future. The two missing masts were recreated using photographs of the model lighter prior to them being lost. The masts were made from sterling silver. The horizontal yards were soldered on as were two small brass machine screws, which attached them to the ship. The masts were two different heights, and the screws two different sizes to differentiate their placement fore or aft. After the masts were created, they were tumbled to harden the silver so it would not be so malleable and could be handled. The base was surface cleaned with a mild detergent and then relacquered. After all components of the ship were treated they were reassembled and packed for shipment back to the client.